It was learnt that Paul, a commercial motorcycle operator, fled his home in Uromi when his wife, Ugomma, had the three identical baby girls. He was also said to have ignored phone calls from his wife, whom he married 12 years ago. 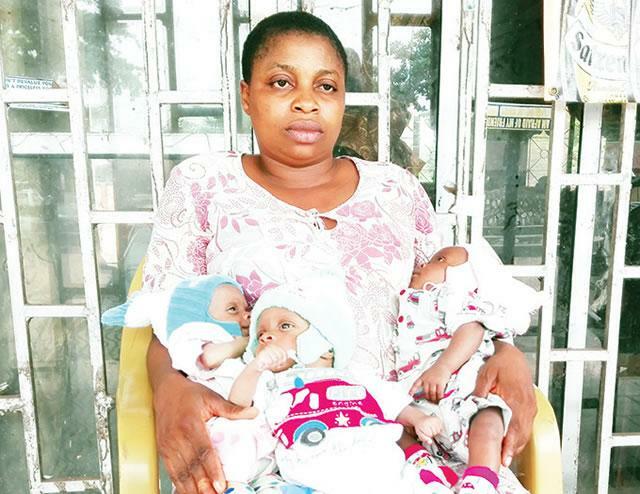 Ugomma told Punch on Tuesday that her husband had lamented his inability to cater to the triplets as he struggled to take care of the two children she already had for him. She said, “My husband ran away because he could not take care of the babies. I had my antenatal care in a hospital. But I put to bed at home. The nursing mother, who hails from Abia State, lamented that her husband’s absence had left her and the children stranded. She noted that she had been living on alms from kind Nigerians. She appealed to her husband to return home, saying he had been forgiven. Ugomma said, “People have been the ones helping me to buy baby things. I have been going to markets and churches with the babies to beg for alms. She appealed to the state government to also come to her aid. “I want the government and good-spirited individuals to come to my aid to enable me to take care of my babies,” she added.